The Turbo S has long enjoyed a cult status within the Porsche 911 Turbo’s rich history. These iterations were generally presented near the end of a generation’s lifecycle and had the single objective of presenting yet another level of unworldly power in the 911 line-up. Adding to the car’s provenance is that they were consistently finished in a highly luxurious specification loaded with Porsche Exclusive candy. Nope, it doesn’t take a scientist to understand how the Turbo S cars quickly rose to fame within the Porsche community, still being considered true favourites by many fans alike. 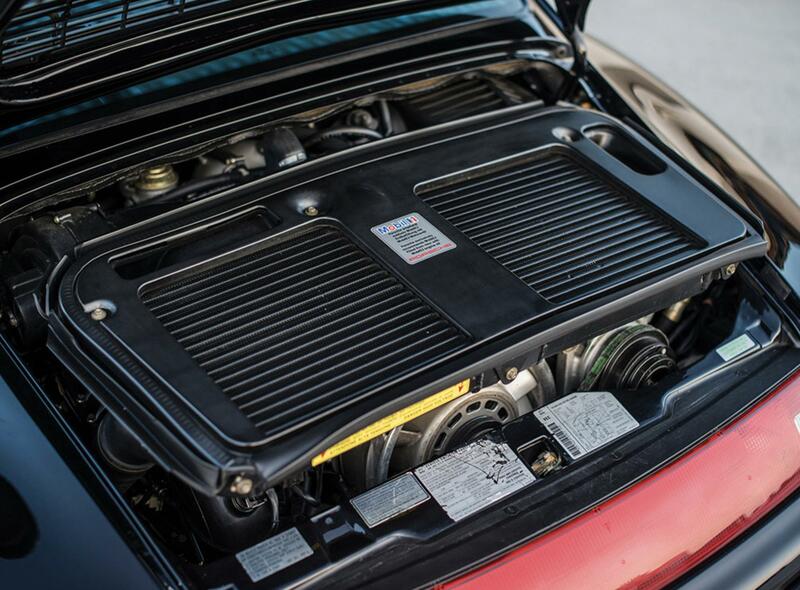 The heart of the 993 Turbo S was a Type M64/60 twin-turbocharged flat six which was pushed to 450hp (430hp for the US-spec cars). 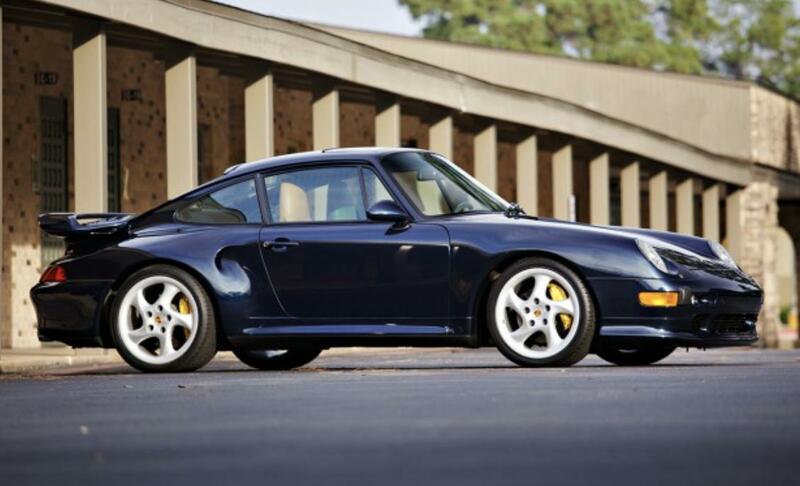 A massive 423 foot-pounds of torque is delivered at 4,500rpm through a Type G64/51 six-speed manual transaxle to all four wheels; a technology the 993 Turbo cars inherited from the earlier 964 Carrera 4 cars. 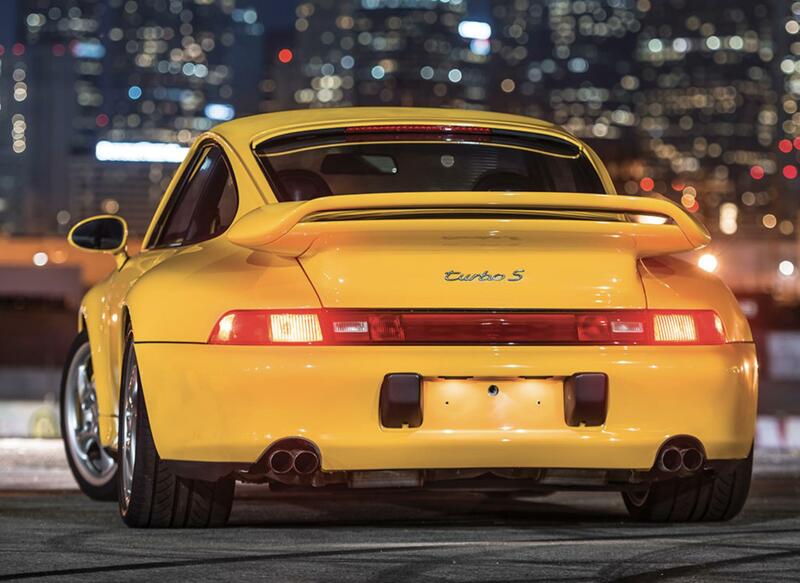 The resulting performance brought the 993 Turbo S in a league of its own: 0-100 sprint took less than 4 seconds, a standing quarter-mile in under 12 seconds, and reaching top speed at 295kph. The power increase over the standard Turbo was mainly achieved through larger K-24 turbochargers and further tuning of the engine management system to produce more power. An extra oil cooler to handle the increased heat load was also added to the engine setup. On the outside the Turbo S, already wearing Porsche’s aggressive “wide-body” look, had air intakes in the tops of the rear fenders. An updated exhaust system featured 4 tips rather than the standard Turbo’s classic dual exhaust system. Front and rear spoiler were updated to ’Aerokit II’ spec with an impressive biplane rear-deck version of the whale tail and a front spoiler with special brake cooling inlets. The 18-inch (seems small by today’s >20-inch standards!) five-spoke Turbo Twist alloys featured a matte, polished finish. 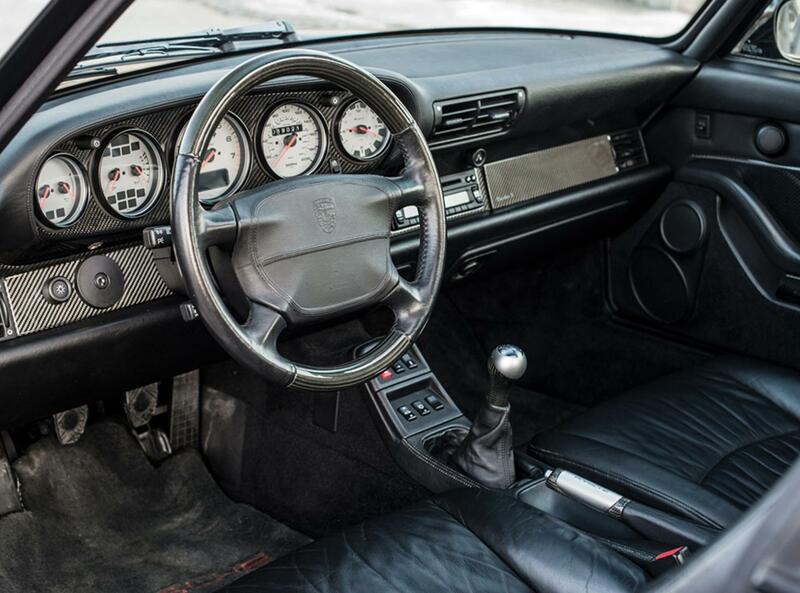 Inside was a feast of Porsche Exclusive’s finest fittings: fine leather, an abundance of carbon fibre covering the dash, the doorsills, the center console, door panels and door pulls. Two sets of colour-coordinated front seatbelts added to the interior’s appeal. Special “Turbo S” trim script was visible on the engine cover, wheel centre caps, interior carpeting, inner door sills and steering-wheel hub cover. A carbon-fibre support bar was fitted under the front lid to add to the car's rigidity. It was indeed a marvel of a car, demonstrating Porsche’s pedigree at its best both technically and aesthetically speaking. Only 345 models left the factory, of which 183 cars produced for the United States and only 23 in right-hand drive. Such levels of Porsche prestige commands a high price. The past 5 years 993 Turbo S values have followed their RS counterparts into stratospheric levels, although prices seem to stabilise slightly this year. Classic color cars (Basalt Black, Artic Silver and the likes) stand at $300,000 today, with non-classic coloured examples commanding at least a $100,000 premium. Unfortunately the status of the Turbo S has waned over the past years, largely due to the introduction of the model as a mere line extension above the Turbo in the facelifted line-up of the 997. The Turbo S still makes up Porsche’s most mesmerising supercar, combining top-class performance with the level of refined luxury to perfectly accommodate everyday usability. But it has become less exclusive due to larger production numbers and even more so because of its less distinctive styling versus the ‘standard’ Turbo model. Porsche’s decision to fix the Turbo S in the 911’s permanent line-up was certainly not a bad one from a sales perspective, yet we are still hoping that Porsche will return the Turbo S to its cult status in the future - ideally in the form of a limited production car with Porsche Exclusive options made exclusively available for the Turbo S.
Picture credits to RM Sotheby's and Gooding & Company.